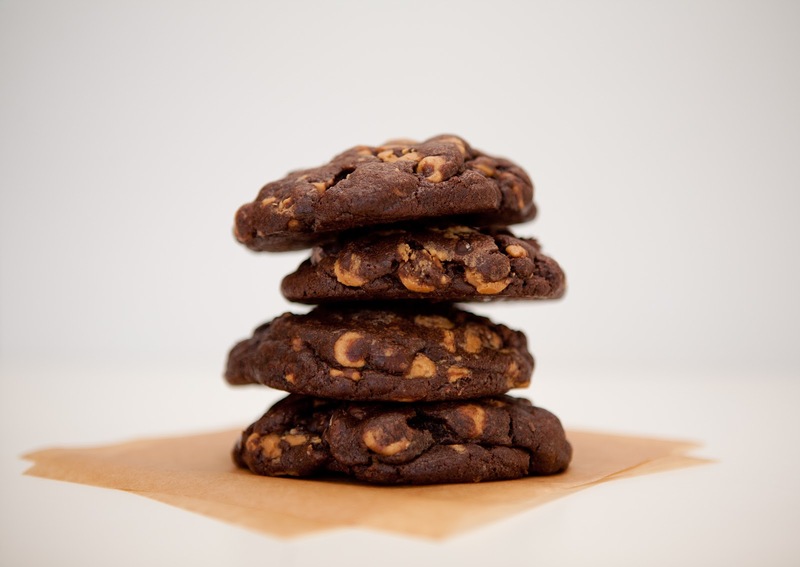 Perhaps the only thing better than a Levain Bakery Chocolate Chip Walnut Cookie is a Dark Chocolate Peanut Butter Chip one, still warm from the oven and gooey in the center. However if you, like me, don't live near Levain and are even a little proficient at baking, please try these at-home versions. You can even make them gluten-free if that's your thing. 1. In a medium bowl, whisk together the flour, cocoa, baking powder, baking soda, salt and instant espresso powder (if using). Set aside. 2. In the bowl of a stand mixer fitted with the paddle attachment, cream the butter with the sugars until light and fluffy. Stop the mixer and scrape down the sides and paddle. Add the eggs, one at a time, mixing on low speed until incorporated. Add the vanilla and mix to combine. 3. 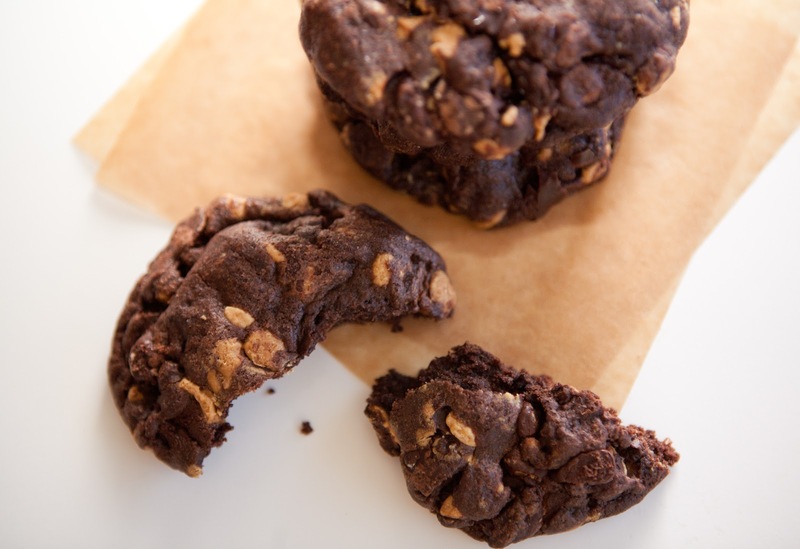 Stop the mixer and add the flour mixture, chocolate chips or chunks, and peanut butter chips. Mix, starting on the lowest speed and progressing to medium-low speed, until the mixture just comes together into a uniform dough. Be careful not to overmix, or the dough will become tough (or gummy, if using gluten-free flour). 4. Refrigerate the dough in an airtight container or plastic wrap for at least four hours or, preferably, two to four days. 5. When you're ready to bake the cookies, remove the dough from the refrigerator and let it stand at room temperature for about 30 minutes, or until it's softened a bit but still cold. 6. Line two half-sheet baking pans with silicone baking mats and/or parchment paper. Heat oven to 350 degrees F.
7. Portion the dough into 6-ounce or 3-ounce balls. (If you don't have a kitchen scale, use a half- or quarter-cup dry measure.) Place dough balls on baking sheets, spacing evenly apart and at least 2 inches from the sides. 8. Bake for about 12 minutes (for 3-ounce cookies) to 20 minutes (for 6-ounce cookies), rotating the baking sheets back to front and top to bottom halfway through baking. Remove the sheets from the oven and place on cooling racks for five minutes, then transfer cookies directly to racks to cool completely.